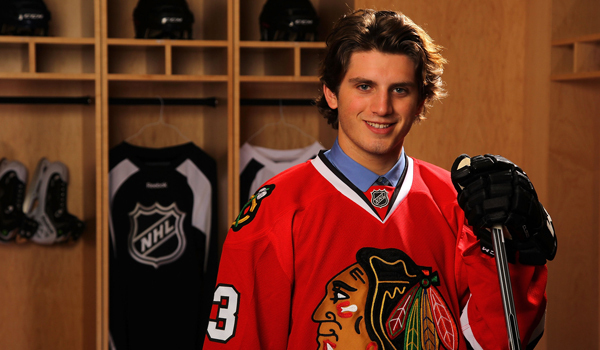 Ryan Hartman, a rugged forward from West Dundee, Ill., was the Blackhawks’ No. 1 selection at the recent National Hockey League draft. He recorded 23 goals, 37 assists and 120 penalty minutes this season with the Plymouth Whalers of the Ontario Hockey League. While attending Blackhawks Prospect Camp this week, he sat down with Blackhawks Team Historian Bob Verdi for an extended interview. You aren’t able to play because of recent surgery on your right shoulder. But you still get to wear all this clothing from your favorite team. Hartman: Yeah. Pretty cool. I’m going back to Plymouth next season, but I can take stuff with me. At least I think I can. That Blackhawks gear will go over well in Plymouth. Michigan. That’s Red Wings territory. Their logo is everywhere, just like the Blackhawks logo is everywhere around here. Wasn’t always that way when I was a kid, but this was always my team. Can’t accuse me of jumping on the bandwagon. What is your first recollection of the Blackhawks? I loved hockey as a kid. Then I went to a few games when I was really young. You couldn’t watch home games on TV then. Tony Amonte was one of my favorites. Now, with this team, two Stanley Cups. This is amazing. I’ve played all three forward positions. A lot of center this past year. We’ll have a young team next season, so we’ll see what happens. I’ll try to be a leader. And I’ll have the NHL package on my computer so I can watch the Blackhawks. Where were you for Game 6 in Boston? At my aunt and uncle’s in Lake Zurich. With my dad, Craig, and mom, Kim, and family. We built the whole day around watching the game. Looked like there was going to be a Game 7. Then it was tied. I got up for a bottle of water; I was pretty antsy and needed to be hydrated. Almost missed the winner. After the game was over, you looked at the guys on both teams, the Bruins and Hawks—it was like neither team believed what just happened. Most scouting reports label you as “abrasive.” Agree? I like to mix it up, yeah. I’ll fight if we need some energy. Maybe four of my fights came from being jumped after a big hit. I like contact. That’s why I admire Andrew Shaw so much. So he’s your guy? But you’re bigger than him. You’re at 190 pounds. That’s what makes him so impressive. He’s just a little guy, and he gets under people’s skin. He’s fearless. In the playoffs, he’s mixing it up with Zdeno Chara, who’s a giant. And Shaw threw him off his game, created turnovers. Little body, big heart. Soccer and football. I played some tight end. Liked to carry the ball, hit and be hit. Always enjoyed contact. Football was my last sport before becoming just a hockey player and concentrating on that. What do you for fun, besides collect free clothing? Love the outdoors. My grandmother has a place in Hilton Head, S.C., where I was born. Went down there after the draft and played a lot of golf. She belongs to all the clubs down there, so I can play for free and get spoiled. I can hit it pretty good, shoot in the 80s, maybe better sometimes. In the winter, if it’s not too cold, I fish. I like to hunt. Never deer. Mostly turkeys. Turkeys. Do you eat what you hunt? I might eat it, but I don’t cook it. Although I have taken a cooking class. Turkeys, you have to pluck them, then gut them. Mom handles the cooking. Duck is good. Geese, not so much. They’re tough. So, take us back to draft Sunday in New Jersey. You’re waiting for your name to be called. OK, if the Dallas Stars select you at No. 29, are you crushed? No. If it got to No. 30 and the Blackhawks passed over me, that would have hurt. After the 29th pick was made, I looked over to the Chicago table. Mark Kelley (Director of Amateur Scouting) was facing me. I was trying to read his lips, to see if he was saying “Hartman.” Couldn’t though. Then the Blackhawks went up to make their choice. “From the Plymouth…” and then I heard some screams from across the way, from some of my family and my girlfriend. My parents were seated next to me. Then it got real quiet. My heart’s racing. And my name was called. An hour later, I picked up my phone, and the battery was down to 2 percent. It just exploded. Oh, I think so. My dad is 6-2. His one brother is 6-5. Another is 6-6. So, when you make the Blackhawks, you’ll not only be abrasive, but huge? That would be nice. When the time comes, I have to make the team first. Got a lot of buddies around here who think it’s really cool that I got picked by Chicago. Which it is, but I have a long way to go. I met Michal Handzus the other day. Coach Quenneville too. He showed us some Stanley Cup pictures. Makes you want it even more. A Chicago native, Chris Chelios, just got into the Hall of Fame. Another local, Eddie Olczyk, had a great NHL career. Is that an inspiration? They go back a way, but, yeah, this always has been my dream. Play for my hometown team. Now they’ve shown faith in me, and I have to work hard to earn it.